CLOSED! Woooot! What a ride–and so many charming (?) dragons, to boot! Thanks so much, y’all, for coming out for the romp that was Round # 30. Results will post Saturday afternoon ET. Heeeheheheheeee!!! You all still have me giggling (and sniffling) over your stories of La Gioconda and her adventures. Thank you for displaying such raw courage and creativity with what’s normally such a hands-off work of art. Moving on to this week: a bit of easy research will unravel this photo for you, and goodness knows the truth is chilling enough already. But what do you make of these ruins? What happened at this beach? Ahhh, now these are the questions. (Here are your contest guidelines). * Word limit: 200-word story (10-word leeway on either side) based on the photo prompt. * How: Post your story here in the comments. Include your word count (between 190-210 words, exclusive of title) and Twitter handle if you’ve got one. * Prize: A stunning e-trophy e-dragon e-badge, a stunning page here at FF, a stunning 60-second interview feature next Wednesday, and YOUR (stunning) NAME over the rooftops of the world (so to speak). NOTE: Winning and non-winning stories alike remain eligible for selection for Monday’s Flash Points. I don’t know about writing, but I’m totally ready to visit this place! Kira ran, her heart beating rapidly in her chest. She jumped at the sound of the water that sloshed around her sneakers, so concerned around looking over her shoulder that she hadn’t realized she reached the beach already. Checking the device on her wrist; twenty minutes left. The structure in front of her caused a pause, giving her body a brief moment to rest. The fallen city intimidated her, no one ran towards it during the hunt: unsafe. Stories said the old ruins that rested in the waters near the sand were haunted, likely absurd. This was Kira’s last chance. The sound of metal sliding into place with a rough klank signaled that the soldiers were near. The moon was too bright, risking her capture if she stayed on the beach. Jumping into the open space, sliding against the slanted bricks, Kira braced herself against the wall, pushing upwards. She had to hope that the soldier’s were as superstitious as the people they oppressed. She would hide in the maze, only twenty minutes. She heard another gun click, much closer this time. “Good to see you too, Mei,” she addressed her former partner, turning. I love the chase; written so well, like I was there with her. x. .
And spoke of the urge to share his wealth. I didn’t care that we’d just met. He said, “You’re lying, but I don’t mind. “I had a daughter just like you. I worked so hard I barely knew. Then one day she ran away. Then I moved out, I couldn’t stay. It crumbled never to rise again. Oh. My. Chills. Beautiful. Thanks so much for sharing. It started out like any other day. The warm sun rose over the horizon, the waves lapping the sand. I stretched out on my hamaca outside my cabana. The wind fluttered wisps of my hair across my face. Birds called out to each other and a few trees down the beach, I heard a coco drop to the sand. A high-pitched noise entered my consciousness and grew increasingly loud. I opened my eyes and looked around. My heart beat strongly as I caught a glimpse of a dark object in the sky. Fear churning my stomach, I turned my gaze upwards. “¡Madre de Dios!” I cried out. Whatever it was, it was big and moving fast. I wanted to run but the fear froze me. The sound was unbearable. I clasped my hands over my ears but I could feel it through my bones and in my stomach. A long, dark shadow flew past me, its powerful wind knocking me over. I felt it land before I heard it. Two hundred feet down the shore. La caída de los extraterrestres. They were here. I like it! Great twist! The anti-aircraft guns had been pounding the skies relentlessly from the bunker set into the cliff face, its maw jutting upwards so that the cannons could swat down the enemy like flies; the sea bunkers housed yet more artillery facing out across the water as a defence against incoming enemy ships, although that was scant comfort to those stationed in the battery that night. Their enemy wasn’t a fleet of ships. They fired all they had, shells and bullets exploded into song like so many cracks of thunder as they raced towards their targets, weaving a fire-storm which threatened to rip their enemies apart in mid-air, yet the enemy was swift and manoeuvred in ways that no soldier could anticipate, evading the deadly projectiles with inhuman ease. Finally, the last of the shells had been used up; the soldiers had no choice but to rely upon what remained of their rifle ammunition, then finally, their handguns. Before long their weapons clicked uselessly as their eyes widened, grimaces becoming involuntary screams as the enemy bore down upon them without hesitation, rending them asunder and reducing their remains to ash. At dawn, the fortifications were naught but smouldering ruin. So… Dragons, or people with really good flame throwers? 😉 I find it interesting that four of us so far have managed to either tell dragon stories, or stories that could be construed as dragon tales, and all four of them are so different. Indeed! “naught but smouldering ruins….” Nice. I stepped onto the palimpsest of the pristine beach, repressing a shudder that had nothing to do with the chill of the stiff breeze. From the road it had been easy to be fooled; time and tide had conspired to soften those gaping wounds with silt and a light dressing of weed, so that an idle glance showed only an extension of the cliffs, but blink and here was a line of brick, there the frame of a door. “Meet me here,” he’d said. I’d woken still clutching the phone, an unanswered call blinking on the screen. I’d checked: number withheld. And then I’d laughed at myself for checking. An unanswered call. He couldn’t have spoken to me. Of course he couldn’t. He was in the house that night, when the sea finally took the cliff from under it. And that wasn’t my fault. Everybody says so. I walked into the shadow of the wildly canted wall, not certain why I had come, and something caught my eye. It couldn’t be, but knowing that couldn’t stop me scrambling to reach him. And my slight weight couldn’t have been enough to bring the structure down around me. “tide and time had conspired,” love that. This is so haunting. I like it. In the end we did not defeat the enemy, we outlasted them. They left, but we have always known they would return. When they first came, we tried to fight but there were too many of them. Thousands fled, others stayed accepting their rule. Many of us died. The kindness and mercy they promised was a lie, for it was only given to their people, and no matter how hard we tried to look and act like them, we would always be something to be less in their eyes. We lived by their laws, but their laws gave them the right to do with us as they pleased and they made a sport of killing us. Today I saw their ships on the horizon, and I have called my brethren home. When they try to reclaim what is ours, we shall crush them in our talons, for we have re-awakened, and I have learned to breathe fire. I like the foreboding! Nicely done. I really enjoyed the voice of your piece. The resolve at the end is great. I agree with Lizzie; great point of view, really enjoyed the scope and alternative history as well. I looked at her like she had lost her mind. “You’ll what?” She stood in front of me and squared her shoulders smiling. She was an inch or two shorter than I was and not necessarily muscular. But I knew better than to challenge her. I had seen what she had done. “Yes go on,” she said. Jophina wasn’t convinced. Too many of the huge, blockish objects were sticking up out of the watery sand, as if they’d been once buried and then heaved upwards by some global event. The NUUC had been creating “global events” on planets like this for almost a hundred years, diverting asteroids with the proper elements to crash into pre-inhabitable worlds, preparing them for terraforming. Jophina waded off into the surf, leading the officer towards one of the larger objects, one that seemed to have a differently-textured protrusion on the bottom. Jophina scraped between two of the patterned blocks. Really interesting concept, enjoyed this one! Beautiful use of language. Enjoyed this very much. I just read the story of Demeter and Persephone after reading your story; great stuff. Thank you all! Yes! I saw the photo, and one word popped into my head, “Persephone”! I saw her perched on that edge, and the story took life. ‘Nothing, Maman,’ she said edging into her room. ‘Nothing! These will have you sent to the camps!’ said her mother holding up the fine leaflets. ‘Non, you don’t! Who put you up to this? We can take these to the Commandant. Keep you safe.’ Adele recognised the pleading in her mother’s voice. Its tone echoed throughout the town, the city, the whole country. ‘Non! I will leave. I can disappear. I have friends,’ Adele said. Her mother swift with frenzy reached the door fast and snapped the lock closed. Her mother gone, she packed making sure she had the map and the sketches of the bunker. She climbed down through the window that had become her doorway to this world. She would head to the farm first. Le Professeur would be there. This evening, they needed to warn the printer, his daughter, the farmer and the old lady at the cafe.Tomorrow they would inform the rest. Very aptly titled! Ordinary people doing the work of soldiers. Often I neglect a title so glad I didn’t this time! Thanks. “Adele recognised the pleading in her mother’s voice. Its tone echoed throughout the town, the city, the whole country. Terrifically palpable! And thank you, Marie. Thanks for that. Much appreciated. Brigitte raced across the sand. She desperately refused to slow herself by looking back. The barbaric shouting propelled her forward. Brigitte had been enjoying the deserted beach, unhurriedly checking on her catch, when the foreigners had arrived. It was a small boat, though she had seen bigger sails on the horizon. The men took one look at her and lunged. Despite herself, Brigitte glanced back and stumbled. Her hands dug into the wet sand, pushing her forward even as her skirt tangled in her legs. She had to make it to the ruins! Something eerie about them always fended people off, but Brigitte wouldn’t be cowed today. Hopefully her pursuers would. The quiet command brought her up short. She was almost to the ruins, and no one else was in sight. Maybe this was nothing but a nightmare? The lewd cheers behind her claimed otherwise. She pressed on, skidding to a halt when two glowing, green-and-gold orbs appeared in the ruins. Making a frantic decision, she dove into a darkened alcove, inches from the orbs. Warm breath brushed her shoulder moments before wings launched into the sky. Fire blocked her assailants. Brigitte’s breath caught at the magnificently unreal sight. The dragon’s head swiveled toward her. You’re safe. As I stated earlier (but in a later thread), I find it interesting that while four of us had the same idea, we all took them in different directions. Bravo for the dragon saving the maiden! I HAVE NOdragon IDEAdragon WHATdragon YOU ARE TALKINGdragon ABOUT! That emoticon was supposed to be a sarcastic sticking out of the tongue. For some reason it was changed into a big smile. So big smiles! But my previous comment was sarcastic (in case that wasn’t clear virtually). Every day the shadow-man makes his way across the rock face. I’m pretty sure it’s a man. Hunched down, a posture of despair. Slow-moving. A black shape, visible no matter what the weather – in full sunlight or beneath the clouds. The shadow-man walks, heavy footsteps one in front of the other. Like a condemned prisoner being led to his execution. I am still, feet sinking in the wet sand, waiting. My dog pauses next to me. We keep our distance and arrange ourselves this way each time, taking care not to spook the spook. When the shadow-man reaches the opposite side of the rock face, he stops. He reaches out a hand, and pulls on what must be a heavy door. And then, he is gone again, into the tiny brick room slowly sinking into the surf. His outline slips off the edge of the rocks and into the ruins. Back into captivity. I reach down and my dog’s ears shrug back and forth while I scratch the top of his head. The heavy brick-like cube crushing the center of my chest will disappear by the time I get back home. “taking care not to spook the spook.” Love the word play there. And the description of the heavy feeling at the end. I agree – it stood out for me, too. A very atmospheric tale from the title to the end adn so original Love it!! Ooh I like that word, “atmospheric.” Thank you! Running along the golden sands, the surf lapping at their ankles, Damon reached back, grabbing Ruth’s hand, pulling her along. Her chest was tight like a vice as her heart beat frantically, wanting to burst from its confines, her lungs burning with every laboured breath, matching the searing pain on the soles of her feet that even the ice cold water couldn’t sooth. The ruins were in sight; their shelter and safety from their pursuers. Looking over her shoulder, Ruth saw the advancing shadow descending across the coast. It was stupid to go out scavenging so soon after the first attack on the settlement. But Damon was sure it was safe. “This way!” he shouted, desperation in his usually composed voice, hearing the enemy approaching on the wind. They ran through the maze of ruins, graffiti from another age a reminder of human survival. With a single leap, Ruth and Damon were sheltered in a hole under one of the huge concrete blocks as fire reigned down and the thunderous roar of dragons shattered the air. “That was a close one,” he quipped. “Best get comfortable Ruthie; it’s going to be a long night.” Ruth nestled against Damon’s chest, his heartbeat soothing against the continued roar of the dragons. Actually it looks like we’re at four so far. There’s TheImaginator’s which I interpreted as fighting dragons, there was my implied dragons getting ready to defend their land, there’s your ‘Running to and beging saved by a dragon story and Lizzie’s running from dragons…. So two for and two against? True! I actually really liked the way your story presented the dragons and how you revealed them. And I meant to say earlier (before I got distracted by all the pretty shiny dragons) Bravo! The description of the pain of the chase is fantastic. Great story. A Titan princess, lovely thought. And I always made mine eat their veg, too. The cry was met by moans until it seemed the ocean itself cried at the crackling storm. Alwain understood their anguish. He had watched his people wither away during the flight from their land. But it was the way of elves to accept nature, not beg for death. Shame overwhelmed him. The lightening subsided, and he heard the sound of wings. When he looked up he saw the black owl hovering above. Its eyes glowed in the darkness. “You have been heard. I grant the gift of mortality to those who wish it,” the owl said. Alwain watched the suffering move toward his enfolding wings. He closed his eyes. No. In the morning, sunlight awoke him, and he lay upon a strange beach. Other elves lay scattered near him. A white owl perched on a rock that seemed scooped out almost like a chair. I like the ending statement, because, as the white owl says… it is all a matter of perspective. Totally agree. Gave me goosebumps. They came from the sea, stepping slowly onto the fresh birthed island, webbed feet flapping on the sand. The elders were hesitant, unsure on the surface, but the younguns laughed and scampered across the great reef as if it still lay beneath the waves. Up the beach, Dorn the elder stood in the shade of an outcropping, hiding his tender scales from the burning sun, watching his youngun Lar as he chipped and sampled and measured the rocks. Dorn fluttered his gills in good natured amusement. Lar walked to the water, reflected sun shimmering on his bluegreen body. Dorn shook his head, laughing. He cast a last look at the reef, then returned to the darkest seas, safe in the belief that their world would last forever. Nice job with the twisted language. Just enough, and not too much. Call it my Planet of the Apes moment, like when Charlton Heston rounds the bend on that beach (“You maniacs! You blew it up!”) and there’s the mangled Statue of Liberty. I strolled this beach to escape the tourist kitsch of Capbreton, but I hadn’t expected the scale of this tumble of man-made fortifications. 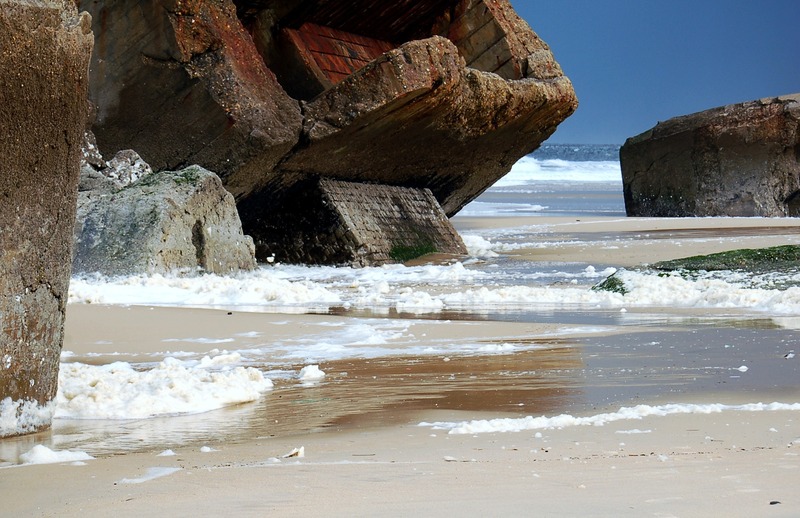 I wondered if Allied guns had crumbled them or the relentless Atlantic Ocean. The voice startled me. I put a hand up to shade my eyes. A man stood next to the round blockhouse, the sun back-lighting him. I caught a hint of gray clothing and polished boots. I thought I heard him sigh. A seagull screeched, and I turned to watch its flight. When I turned back, I was alone. I scanned the beach and saw nothing. The wind carried a name to me, and it echoed among the ruins. How fitting, then, he should guard what he built, the man who loved his country; not his Fuhrer and died for that. Well done! I had thought about having someone still guarding the old gun batteries, but in my case they would have been at least 90 years old (or subject to some sort of wibbley-wobbly, timey-wimey… stuff), I didn’t think about old ghosts. Well done indeed. Very nice. Gave me a chill. Bumps rise on my arms as I watch the shadows start to creep towards me. Something crunches under my feet – bones – and I give a shuddering jump in response. Water reaches out for me, climbing up my legs and sending me into a spasm of shivers. Something is whispering in the dark. I can see its wet mouth slapping together as it backs away, drenching itself in the darkness of the ruins. A shriek rings out from behind me; it rattles through my body and leaves my teeth clicking together madly. I take tentative steps toward the dense darkness, the sneaking shadows that the ruins conceal. And I hear it. Thick breathing. Muffled tittering. I reach out a tentative finger and give the shadows a poke. They laugh. I breathe. “Found you. You’re it,” I say. And I turn and run. Run to find my new place. Seashells crunch under my feet. The water tickles my bare legs. Our dog Lily pants wetly from under the cool shade of the ruins. A shriek of laughter bursts from my own mouth, echoing across the beach. I run until I find the perfect spot. Then I crawl in and join the shadows. Of course I notice I’ve put “runes” instead of “ruins” throughout the piece right after I hit submit. Hopefully you can disregard my brainfart! Times like these I really wish I could edit comments! My OCD side is infuriated. SO sweet! LOVE this one! Very nice turn around, going from fear to play! You completely surprised me! Love it! I raced across the beach, my heart thundering in my chest. I wondered if we were going to make it out of this alive. I clutched Chen’s hand as we ran, her fingers digging into mine. I could feel the sweat on her palm, making it slick against mine. We ran towards the ruins of the old city, monstrous stone monoliths that were from a civilization lost to time. My feet pounded on the sand, kicking the rough grains into my boots. We ducked behind one of the fallen stones, ignoring the cold snow that sloshed about our legs. I could hear them coming, the pursuit was still on. I turned and looked at Chen. She stared right back at me, determination on her face. “I guess it’s time then.” My fingers closed on the cold steel of the gun at my hip. She hoisted her own. “It’s time, Devin.” I took one last look at her, wanting to take in all I could of the woman I loved. She gave me a small smile and it took all my will to tear myself away. I turned and leveled my weapon at our enemies, ready to pull the trigger. “Here we go.” I whispered, letting the bullets fly. Desperation, there was no other way to describe it. The calm tides pushed the unconscious young woman towards the shore, her long brown hair flowing freely with each push and pull. Her white shirt clung to her body. Her blue eyes flickered open, and she coughed up water. Her hands grasped the wet sands and held onto them for life, as if she was afraid the waves would reclaim her. Or worse, bring them back to…him. She shuddered at the thought of him, his dark hair and his hollow, covetous eyes. Eyes where shadows circled the irises like vultures over a desiccated corpse. Morrigan gazed at the ruins that lay across the beach, lost to time. Summoning her remaining strength, she ventured closer to them. They were made of brown and gray stone, now shadows of their former days, where once they stood tall and mighty, reduced to nothing by cannon fire. No doubt he came here, she thought. Morrigan stared at the surrounding area, the island devoid of life. She turned to the distant sea. He will come for me, she thought. No one escaped the Pirate King, he would always find them. Her escape was only momentary. And from the horizon, she could see the red sails. It was a popular tourist stop, the ancient shipwreck, the mighty ship that lies decayed on the shore. The legend lives on everyone’s tongue. How the captain rescued each and every passenger and then after having swum to the shore with his injured shoulder, had returned to rescue a stowaway, and how he collapsed when he finally reached the shore, never to open his eyes again. She had tears in her eyes the first time she heard it. She stands on the shore with her clipboard, absentmindedly tapping the pencil. The impending evening looms large in her mind. She thinks of the chill in Roger’s eyes. Her first tour is arriving. She shakes her thoughts away like a dog shaking water out of his ears. It’s a lively bunch with many couples. She welcomes them. They are eager to hear about the ship. Her speech is rehearsed, the rise and fall in her voice, the slight twitch of her nose, occasional downcast eyes, every expression is connected to the narrative. She notices the awe in their eyes, and she tries to satisfy their thirst for more details, digging deep into her heart to bring out more passion. The story of ship’s salvaging sounds eerily similar to salvaging of her marriage. Aww, that made me sad. Nice story though. I never thought they would find us. We’ve been so careful. We always left the cloaking on. We only left in the dead of the night to gather supplies. I should have known something would go wrong. Nothing is ever perfect; it’s been this way since we’ve locked eyes in the trance of true love. He was the town’s “dragon”; “terrorizing souls” with fire magic, and “kidnapping many women”. I was the “maiden princess” who was tempted by him and stolen away. My uncle knows that I loved that “dragon” and I would never love him. I made tracks in the sand as our keep was toppled by my uncle and his foolish mages. Soon, my beloved was brought out in chains. He will be tortured to find me, so I can be brought back to start his corrupt wedding. We shared more than body heat; we shared stories, feelings, and many nights falling asleep to the sound of the waves hitting the sand. I taught him of the world, and he taught all he could; how to use forbidden fire magic. It will be realized that my love is not the dragon that has taken his important treasure; I am the dragon and he has taken MY important treasure. “Are you sure it’s safe?” Abby asked as she stood at the edge of the water. “Why wouldn’t it be safe? They’ve stood for hundreds of years, first as a castle and then…” Emily started. “Did you really have to say that?” Abby complained. “Look I want to see what I can find. Salvage rights.” Emily finished adjusting her clothes and stepped into the water. Abby paced back and forth on shore as Emily made her way out to the middle of the ruins, watching as her lover made it to the centermost column. It was an impatient Abby who waited for a sound from Emily, but she didn’t expect the scream that echoed across the water. Frantically she kicked her shoes off and splashed into the water, yelling Emily’s name as she ran towards the column. Scientist’s complexion was gangrenous, his eyes, pale. He swallowed. Trembling like a drunken veteran, Scientist eased himself to the ground. He vomited. Mentally, Soldier noted how proud Sergeant would be. Scientist shook his head in disbelief, pulling his hair and pacing. Soldier lit a cigarette, uninterested, thinking instead of the medal certainly coming. The ground began to shudder, the rubble tinkling like glassware in the middle of a quake. In the distance, she reared her head, stinger glistening in the late afternoon sun, eyes gold and alert, the movement of her wings blowing the shore into funnels. The strange insect clicked. Bee-like-but-still-humanoid creatures responded, surfacing by the hundreds. The Queen’s stinger pulsed. She clicked. Hauntingly, the others joined. Scientist and Soldier’s spine prickled. Original. I really enjoyed this. A warm salty breeze blew my hair around, and I lifted my face to meet the sun’s rays. The stress melted away. I spread out my towel next to Janie’s, where she was already laying out. I still couldn’t believe how lucky we had been to find this part of the beach away from all the other tourists. “That’s what I’m talking about,” she replied in a singsong voice, settling back down. Five minutes later, I opened my eyes and saw something flash silver in the sun for a brief moment several yards away. “Jane?” I whispered. “You awake girl?” No response. She was out. Near a rock far away enough in the ocean that I could just make out was a young woman with long shining black hair. She swam to shore, and I remained still so she would think I was asleep. I peeked one eye open long enough to see her place a silver seashell in a crevice in the rock wall. I didn’t believe what I saw was real until she turned around and smiled as though she knew someone was watching. Eep, forgot my title, lol. Makes me want to hit the beach! She bobbed and weaved to the rhythm of the rather large waves beneath her feet. The darkness began to lift as dawn approached. The three men had left hours before, in the dark. They’d taken the rowboat and she’d heard them screaming their silly songs from drunken mouths. She was glad for their absence. It gave her quiet time, something she hadn’t had in the three months they’d been out on the rickety vessel. She wasn’t quite sure why she’d even accepted their invitation, only knowing one of them somewhat. Perhaps she’d wanted an adventure. Well, that she got. For the first month, Skippy made the meals; they relegated her to toilet duty and lookout in the crow’s nest every few days. It all seemed so archaic; she was a bit surprised to learn there was no plank. Paul and Pidgin, as he like to be called for who knows why, pretty much ruled the ship. After the second month, when she’d changed jobs to cleaning their bunks, she alternated sleeping with Paul and Pidgin, not by choice. The third month got her thinking and that was how she ended up gagged and tied to the main mast watching the rowboat come in at dawn. This was his favorite place to visit. This long stretch of empty beach. No one came here. They said it was haunted, that the spirits of long-past warriors haunted the waves. He took no stock in those beliefs. Once you were dead, you were dead, and that was that. And anyways, the ancient structures were so much fun to explore. The strange machinery and devices inside always puzzling. He was fearless, here, in the ruins of a bygone era. He leapt from tiny ledge to even smaller crevasse, clambering his way up, around, through, over, the wind hissing past him. And here, here was his most favorite place of all. This ledge, this room, so exposed, yet so sheltered. Rusty red and coarse under his fingers, the ever-present tang of saltwater heavy on the air. The air whispered around him, the waves growled below him, and, for a moment, he allowed himself to believe in ghosts. He could practically see the luminescent phantoms rushing around him, their boom-sticks held steady in strong grips, their green clothes soaked with sweat and seawater. For a few long moments, he was among them as they tore into battle. Then he opened his eyes and returned to the land of the living. “the air whispered around him, the waves growled below him” Very nice.